It appears even Gotham's wealthiest bachelor can't escape his civic duty. Batman meets 12 Angry Men in the first issue of the post-Catwoman arc which features Bruce Wayne selected as one of the jurors for Victor Fries' trial for triple homicide. 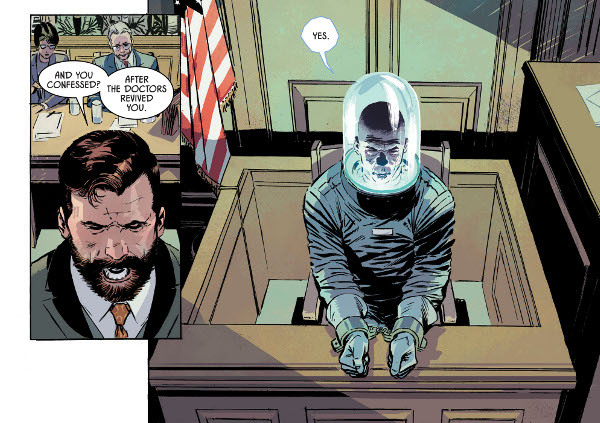 Tied to the courtroom, it falls on Nightwing to act as a stand-in for the Batman while Bruce struggles with listening to a defense attorney rip apart the case Batman built. What is Batman's motive here? Surely the world's greatest detective could get out of jury duty. Is he merely doing his civic responsibility? Is it justice? Or is it guilt? There's an interesting moment here when Fries takes the stand and suggests that he only confessed to the crimes to placate and out-of-control Batman (one who was recently left at the altar). Did Batman actually go too far and force a confession? Bruce's single not guilty vote seems to suggest some serious introspection has begun. It looks like the rest of the jurors are in for a longer deliberation than they expected. Worth a look.